Back in June last year I wrote this short blog about ‘meeting’ the polka dot jersey won and worn by one of my cycling heroes, Robert Millar, at the 1984 Tour de France. I’d encountered it after stumbling into Billy Bilsland Cycles on the way home from an afternoon watching the British Road Race Championships at Glasgow Green. Well it seems as if another trip west (surely a pilgrimage?) is on the cards. Billy Bilsland Cycles have this week unveiled an addition to their Millar tribute. 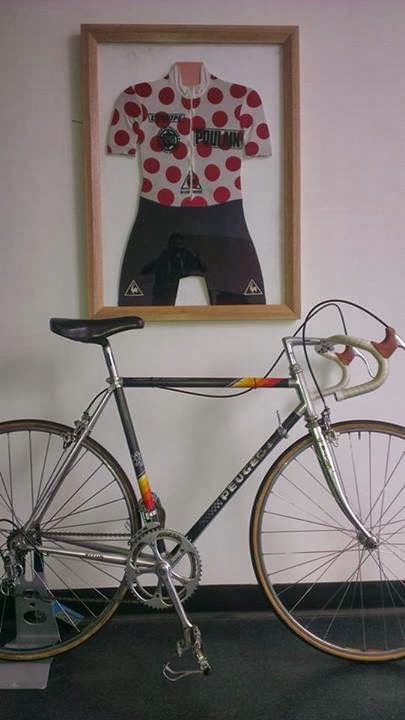 Alongside the signed and framed spotty jersey you can now see the actual Peugeot bike upon which Millar rode to that famous victory. Apparently the bike hadn’t been seen in public for 30 years, having been in the ownership of a private collector. Well now (but unlike it’s ilusive original owner) the bike is very much back in the public eye — and in one of Scotland’s best bike shops too. Definitely worth a trip to Glasgow, if only to marvel at the size of the inner chainring — what, no compact?! There’s more info and a full gallery at Billy Bilsland’s Facebook page.